One of my favorite restaurants in my college town (Fairfield, CT) is Centro on Post Rd. The bread is always served warm with olive oil, tables of all ages are given crayons to color the white paper over the table cloths and everything I’ve ever ordered has been delicious. In college, it was one of the places your parents would take you to when they came to visit or where you’d go with your girlfriends for a birthday dinner. During senior year, we discovered Centro To Go. 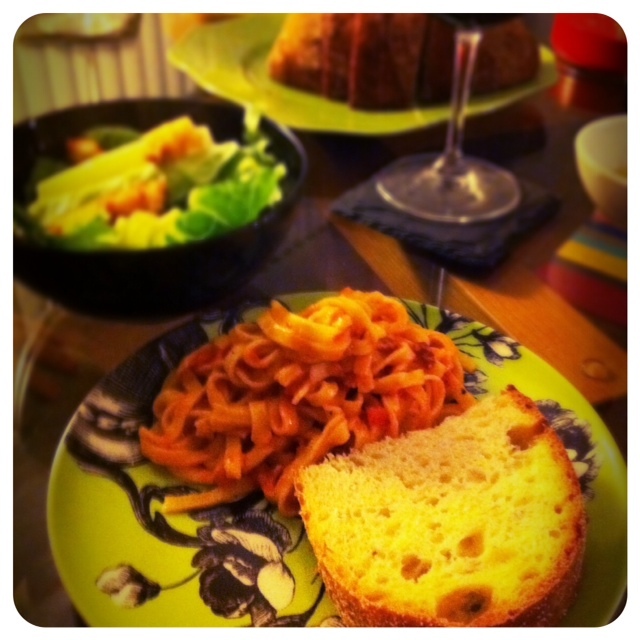 For less than $16 for two or $27 for four, you got fresh homemade pasta, fresh homemade sauce, bread, olives and caeser salad to put together in the comfort of your own home. Simple and amazing. Now that Ben and I are living back in the FC (Fairfield County) Centro To Go is one of my favorite meals to pick-up when we are passing through Fairfield. For Valentine’s Day, instead of an expensive meal out, we planning to get Centro To Go and Ben surprised me by taking care of it all. 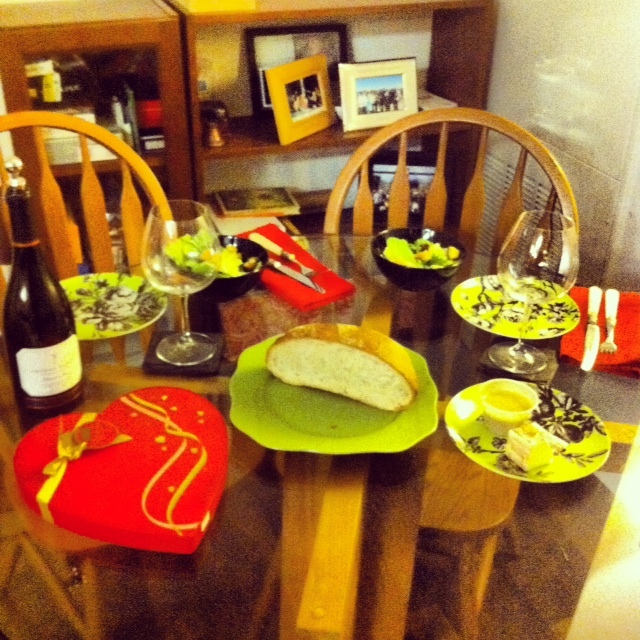 He set the table, picked up some wine and chocolate, and we ate some delicious linguine with vodka sauce. Ben picked up the package for two and we had enough for us each to bring left overs to work the next day. On Saturday, Ben and I ventured away from our normal Saturday routine of lounging at home to grab lunch at Darien’s newest spot, Darien Social. The gastro pub features craft brews and menu items for every mood; including pizza, burgers, and local cheeses. When we arrived shortly after 1pm, a woman on her way out told us, “it’s worth the wait!” Fortunately, we didn’t have to wait at all. 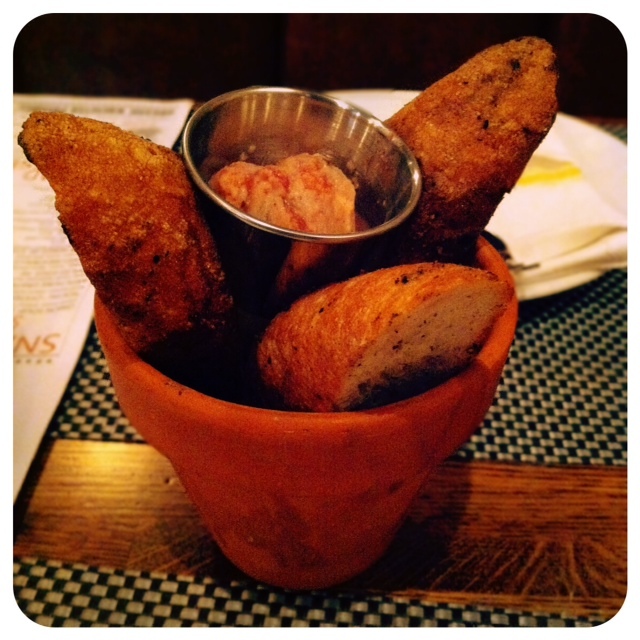 Bread and butter served in a planter. We contemplated the menu for some time. Everything sounded so good and looked so good, I can’t help but peak at other tables. 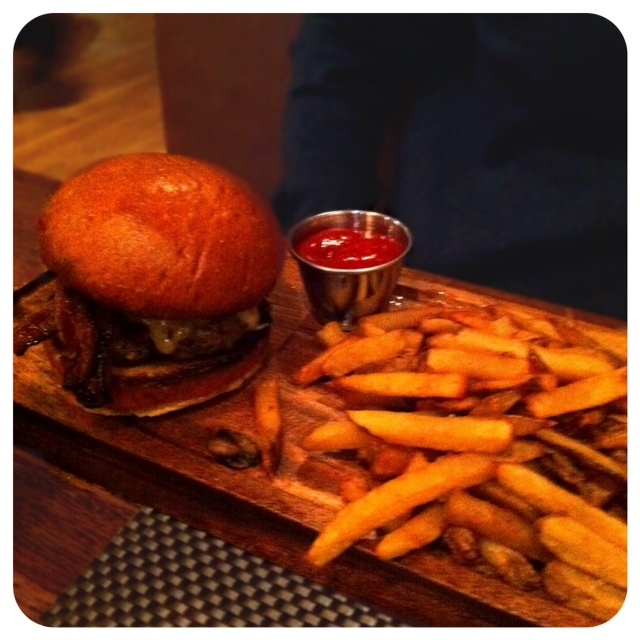 we decided a good gastro pub is only as good as it’s burgers, so that’s what we ordered. 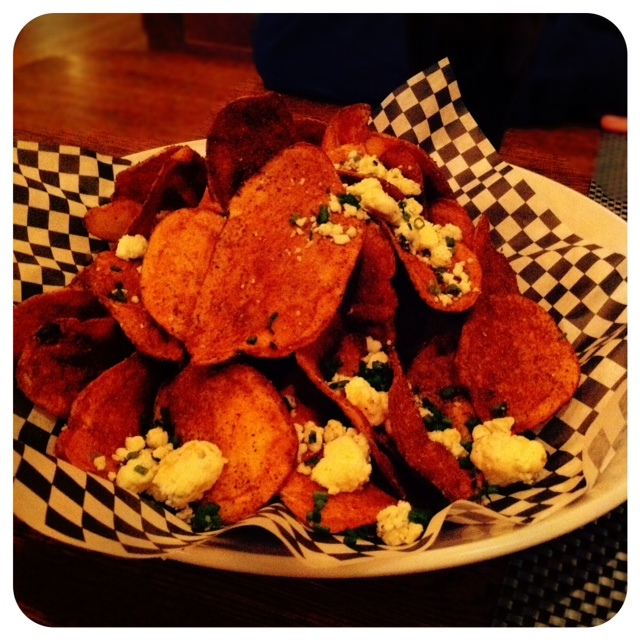 But first, we decided to start with the Kettle Chips, bbq potato chips with crumbled blue cheese. They were a little too spicy for my taste, lots of pepper on those guys. The blue cheese helped to cut the spiciness. Almost immediately after our appetizer arrived, our burgers were ready. I would have liked just a little more time enjoying the chips. Ben, per usual, ordered the Bacon Cheeseburger. He was a very happy camper. 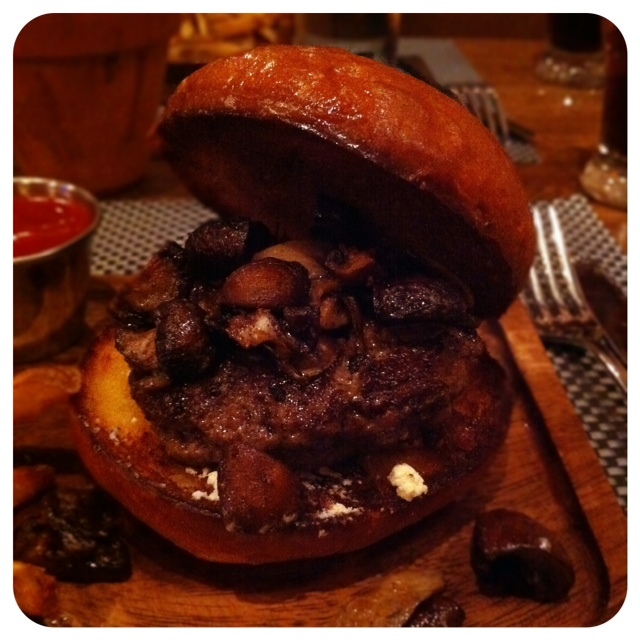 I went for the Shroom Burger, with foraged mushrooms, beltane goat cheese, and truffle. Anything with goat cheee and truffle, I order. Done and done. The goat cheese was tucked away under the burger and it was just perfect. We were stuffed by the end of our meal but we were already planning our next visit. Ben wants to try a pizza and I have my eye on the short ribs…and the mac and cheese…and the swedish meatballs. 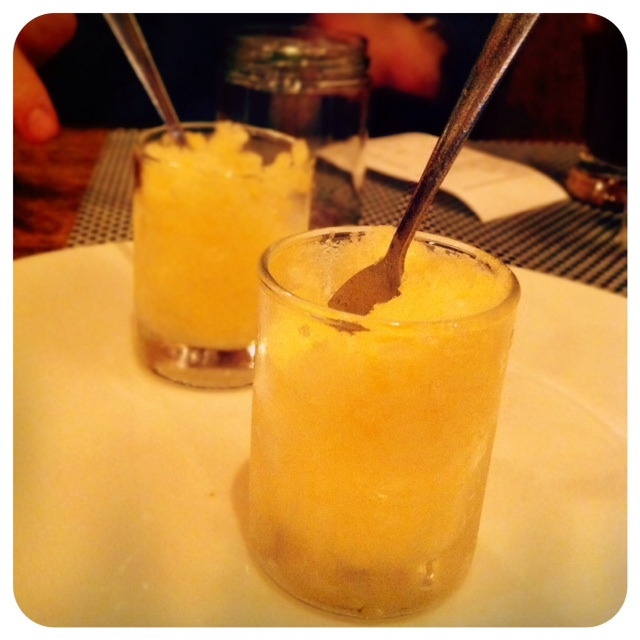 As if we weren’t sold on the place, our check (which arrived in a mason jar) came with two mini peach italian ices. Ben isn’t one for sweets, but I devoured these guys. 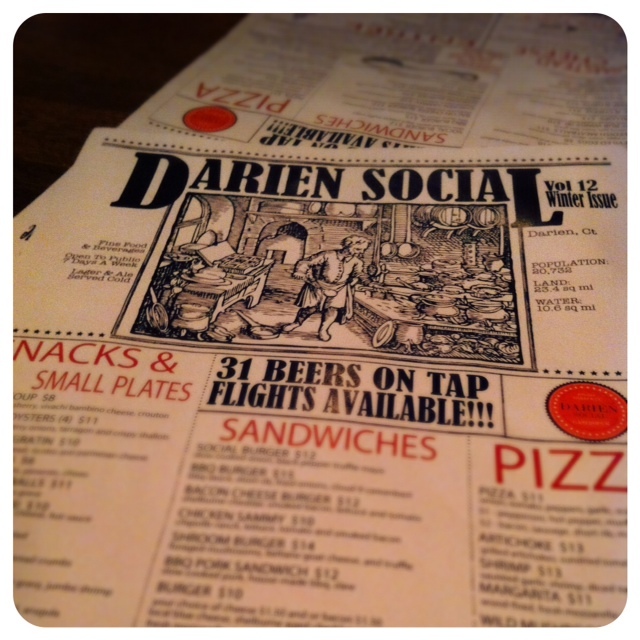 If you are looking for a good, and not to mention local (when possible), meal Darien Social is a great local spot. And according to our server, it’s pretty happening on weeknights. I bet the location, right across for the Darien train station, helps that quiet a bit.